Autumn is right around the corner, and you know what that means?scarves, boots, and sweaters. It?s a fashionista?s favorite time of year because of the layering and rich colors. Oh and did I mention the pumpkin spice drinks and crispy leaves? Fall is the best. Every year I go through a phase when I want a brand new, Pinterest-worthy fall wardrobe. But without a bucket of cash to spend, I?m left to reinvent my wardrobe with what I already have. 1. Layer. This is huge for fall! Everything looks different when it?s layered. The plain t-shirt I wear in the summer has a new look when paired with a leather jacket and scarf. A classic button-up shirt can get a fall makeover with a sweater on top and riding boots. Get creative and layer items by mixing patterns and textures. 2. Reuse. Summer items can be perfect for fall when they?re mixed with the right pieces. I love to wear my summer leggings with skirts and boots for an extra pop of color. A fun summer sundress can turn into a fall look when worn with tights, a jacket, and boots. 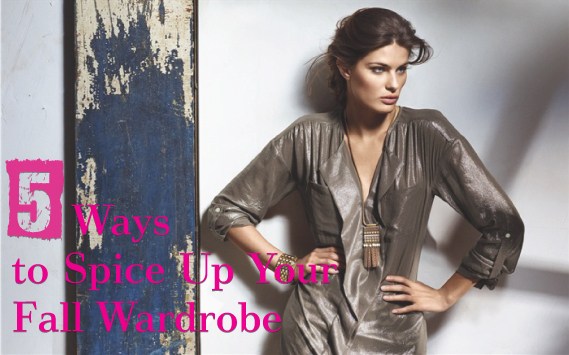 Reusing clothing items from previous seasons will expand your wardrobe immensely. 3. Accessorize. What really pulls an outfit together are killer accessories. Whip out that old scarf, borrow a stylish beanie, or stick with your classic bag. Fall is all about interesting textures, so look for old pieces that can make a great statement on your outfit. 4. Color. There aren?t many rules to color in the fall, except to embrace earth tones, darks, and anything in between. Don?t limit your wardrobe to a certain set of colors that are already in your closet. Mixing a red top with a brown sweater can be a welcome pop of color. As long as part of your outfit has a fall color, you can have fun with other interesting hues. 5. Invest. Once I?ve gone through my wardrobe and seen how things can be reworked and stretched, I do my research to buy a few key pieces. I invest in classic pieces that I know will be in style for a long time or in must-have trends for the season. But I never pay full price and I always shop around. My current favorite source for deals is frugaa where you can find a coupon for everything, especially cute autumn clothes. With a little creativity and a fresh perspective, your wardrobe can be revamped, just in time for a picture-perfect fall.